As VMware vSphere DRS has become more widely adopted now, more and more users are interested in knowing how it works. They need more insights into DRS activity and actions. They want to know the value that DRS provides to their clusters. DRS Lens is an attempt to provide a UI-based solution to help understand DRS better. Provides a graph showing the variations in the cluster balance metric plotted over time with DRS runs. This shows how DRS reacts to and tries to clear cluster imbalance every time it runs. 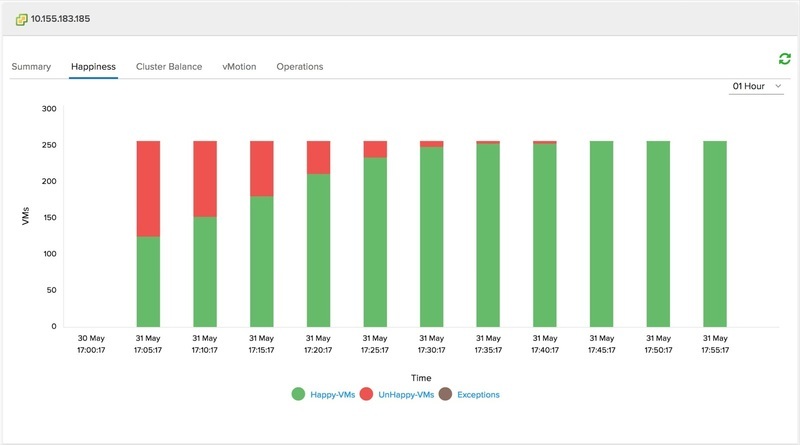 This dashboard shows VM happiness for the first time in a UI. There will be a chart showing a summary of total VMs in the cluster that are happy and those that are unhappy. Users can then select individual VMs to view performance metrics related to its happiness, like %CPU ready time, memory swapped, etc. This dashboard provides a summary of vMotions that happened in the cluster over time. For each DRS run period, there will be a breakdown of vMotions as DRS-initiated and user-initiated. This helps users see how actively DRS has been working to resolve cluster imbalance. It also helps to see if there are vMotions outside of DRS control, which may be affecting cluster balance. This dashboard tracks different operations (tasks in vCenter Server) that happened in the cluster, over time. Users can correlate information about tasks from this dashboard against DRS load balancing and its effects from the other dashboards. DRS Lens provides a simple, yet powerful interface to highlight the value proposition of vSphere DRS. Providing answers to simple questions about DRS will help quell many of the common concerns that users may have. A VMware vCenter server for the DRS Lens appliance to monitor. The deployed appliance VM will be configured with 4 vCPUs and 4GB of memory. Once the appliance is up, and has acquired an IP address, you can use one of the following URLs to access DRS Lens. Upgraded apache tomcat to version 8.5.31 for security compliance.